Belfast, Northern Ireland - Twenty-five years ago, British Prime Minister Margaret Thatcher forcefully and decisively ordered British troops to the Falkland Islands to liberate them from an invading Argentine force. It was a military and political triumph widely supported by the public, leading to conservative victories at the polls for another 15 years. Today, Tony Blair presides over a much different Britain. 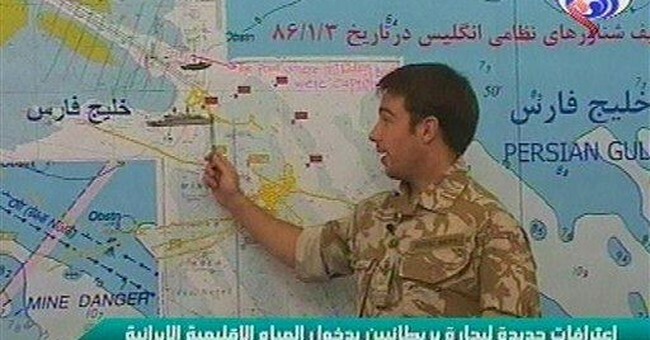 After Iran seized 15 British soldiers and sailors in what it says were Iranian, not Iraqi waters, the Daily Mail called it "a humiliating week for Britain: a week that saw Iran get away with piracy, kidnap and blackmail, a week fanatics played cat-and-mouse with (Britain); a week exposing feebleness at home and impotence abroad." In 1980, Jimmy Carter's failed rescue of American diplomats held hostage by Iranian religious fanatics added to the perception of American weakness, as has America's inability to bring a quick end to the conflict in Iraq, thanks in part to Iran's support of terrorists there. The one calculation made then is the one Iran is making now: the West is weak and will allow itself to be humiliated before Muslim states in order to preserve the lives of and win freedom for its citizens, and that it doesn't have the staying power to persevere in Iraq and other places should its nose get bloodied. The Falklands victory is being used by much of the British media to mark Tony Blair as weak and indecisive. Blair, who has been a stalwart supporter of American efforts in Iraq and the battle against Muslim fanatics in Britain, is pilloried in the Sunday Telegraph for his "unquestioning support of the United States," which has "made us the easy target for Middle Eastern countries who want to take action against America, but fear that country's military might." This gets it exactly backward. Britain is not an easy target of fanatics because of Blair's support of the United States. Britain is a target because it is Britain, just as France, Germany and the rest of Europe are targets for their openness, freedom and democracy. For not banding together as free people, we all risk hanging individually; as Tehran and others prepare the noose from which the weak and indecisive will hang. This is not a war any of us can escape. It is a war that can only be won or lost. The need for a strong response to Iran is underscored in a recent London Sunday Times editorial, which calls for Britain to return to the United Nations to ask for tougher sanctions. In addition, the paper says, "We know (Iran's) people are divided. If Germany and France will not end the valuable export credits for Iran, perhaps Britain and America can give them a helping nudge. Those companies that trade so profitably with Iran might suddenly find a chill breeze in their relations with London and Washington." British ministers are said to be preparing a compromise offer this week to allow Iran to "save face" by promising it will never "knowingly" enter Iranian waters without permission. But why should Iran stop there if its intention is the continued humiliation of the West? Why should Iran, which extracted maximum propaganda value from holding Americans hostage for 444 days, give up British hostages after less than two weeks? The Iranian leadership understands the power of coercion and military might. It is prepared for people to die en masse for its apocalyptic beliefs, concluding the West is not. Iran is pursuing nuclear weapons in hopes of increasing its ability to withstand pressure from other countries when it engages in outrageous acts, such as kidnapping. Britain and the United States had better get the support of all of Europe, or Iran will conclude it can get away with anything. It also would help if the United States and Europe united in an effort to become energy independent, which we can do if we are willing to make the commitment. Starving the Iranian regime of oil and gas profits would be the fastest way to sink it. Anything less will prove, in Iranian eyes, that today's Britain is nothing like the Britain of 1982 and will encourage Iran to pursue strength while Britain and much of the West embrace weakness.